So last night I wasn't feeling that great... and wanted to relax, so I decided to stamp for fun! I get so busy creating for a call of for a Manufacturer that I forget to do that. I decided to play some more with my Papertrey Ink stamps. While I was looking at my pile of supplies that I had dragged out to the couch (I like to stamp there when I am really tired so I can get into a cozy blanket and watch a movie) I thought about the flower in the set... *Light bulb* clear stamps are sticky on both sides! So I turned the flower over to use the part that normally sticks to the block and used that side to create the 2nd flower!!! it also works great as a shadow for the flower. Think about all the ways you can use other clear images! OOhhhhh, my mind is racing at the possibilities with images from other sets! 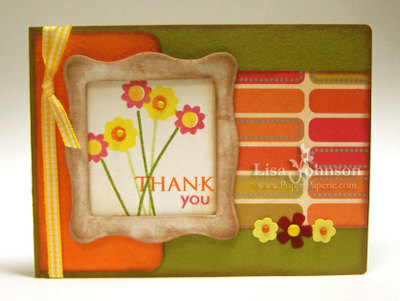 the flowers and bads are by Queen and Co, paper by Prism, patterned cardstock by We R memory keepers and chip board is Plain Jane.